When I told a friend about an upcoming trip to Florida, she recommended stopping by a place she knows where there is a very nice, clear blue swimming hole featuring really cold water. She said she stopped there with her family on her way home from the beach area, and the water was freezing but felt kind of nice after all the sun on the beach. We were staying at a place that had an absurdly late check-in time (4pm!) and we like to start our trips early (at dawn), so this meant we'd have to find a way to pass at least a couple of hours before check-in. 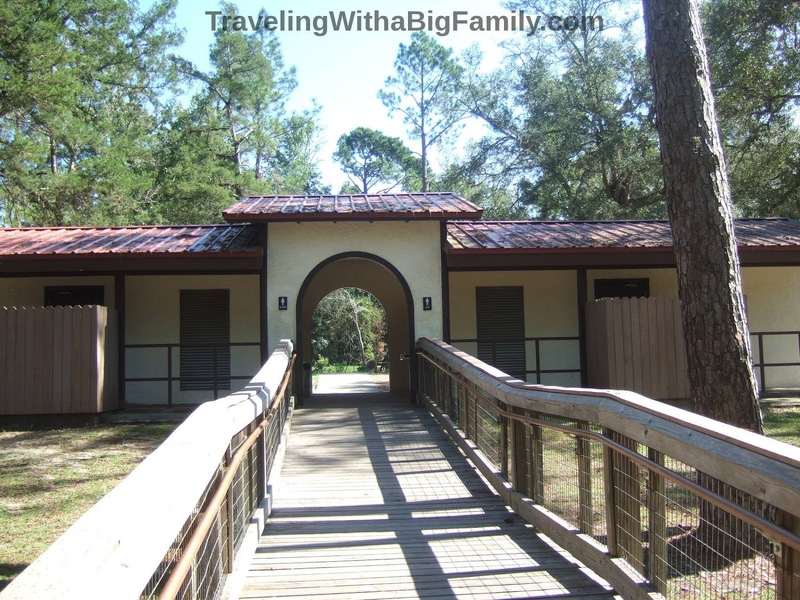 This made a Florida natural springs the perfect lunch stopover for us - we could eat, check out the state park at a leisurely pace, stay as long as we want, and then when we left we'd be only one hour away from the nearest beach town. We packed a cooler with sandwiches and water, and made sure our swimsuits were easily accessible in the trunk. 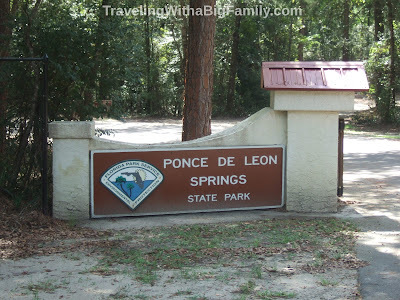 Ponce de Leon Springs State Park, named after the 1500's Spanish conquistador, has a guardhouse where an entrance fee is collected. It is a modest US$4 per vehicle - so for us, about 67 cents per person. There is a building at the entrance parking lot, housing a men's and women's restroom, where you can change into your swimsuits. Before changing, we walked down a little way to the water's edge to check it out and make sure we felt like swimming. When we first walked down to the water, and I saw how people were shivering in gooseflesh, and yipping like mad when they first entered the water, I figured there was no way we'd be swimming. It was October after all, and who wants to be in cold water when the outside air temps are mild? It was warm out, but definitely not hot. Then I put my big toe in the water and knew for certain there was no way we'd be getting in that water! And I had to admit, as we watched people running and jumping off the concrete ledge into the natural springs - it did look like fun. 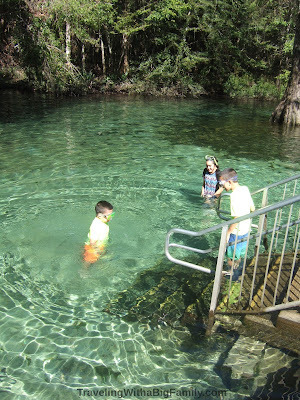 And the area was beautiful - it looked like a type of swamp, but with clear/blue water so you could see for yourself that you wouldn't be swimming with snakes or alligators. So, the kids won: we ran back to the facilities to get changed. "Go on, try it! Get in!" "It's not that bad! You'll get used to it!" My oldest daughter dove in first, going completely under water, then popping up with a big grin. "Jump in, boys, it's not that cold," she said, gleefully misinforming her brothers. I watched my boys get in up to their waists. They reacted as though suffering a mild electrocution. This is the kind of water where eyes get big, and mouths pop open in shock. After snapping a few pictures, I put the camera aside to follow my kids' example. I walked down the steps and dove in so that I'd be underwater completely before I could truly realize how could it was. It was shockingly frosty. Coldest water I've ever felt. But, as they say: You get used to it. We waded slowly around, encouraging the others who hadn't yet braved going more than ankle-deep. Eventually we all got in, and as long as you stayed in the full sun, you eventually could convince yourself that it was "not that bad." Lots of families were there- including many visitors who spoke other languages. We heard English, Italian, and something that I think was Norwegian. Some families nearby were just testing the waters too, deciding whether they really wanted to get in, and we were all laughing together about how this insanely cold water was something we were getting into for fun, and how perhaps the parents should just watch from the benches. We got out and went to the other side, where we took turns jumping off the ledge that overhangs the deepest part. I estimate I went about 10 to 12 feet deep down, and still never touched bottom, when jumping from the ledge. 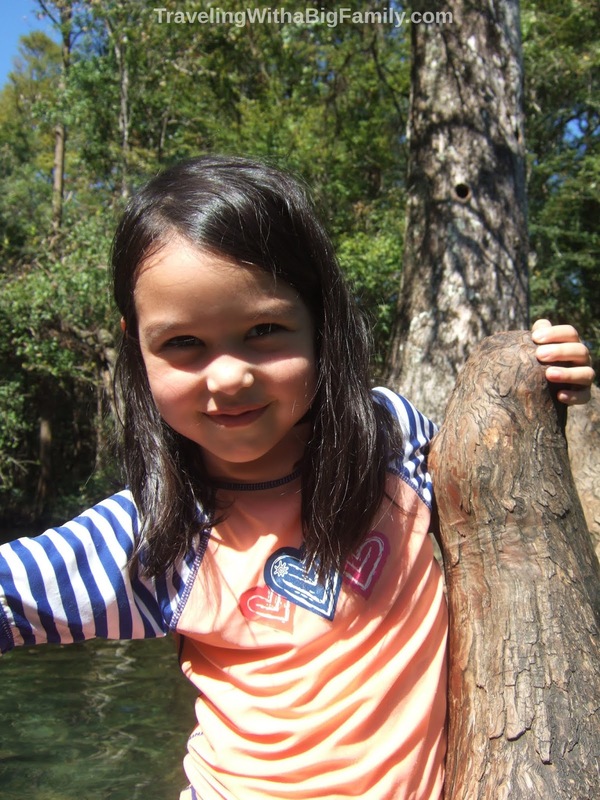 The kids enjoyed putting on their goggles and looking for fish in the shallows near the cypress trees. After a while, and a few more dives into the arctic springs, we got changed into dry clothes and had our lunch at a shady picnic table under the trees. #1 Don't Be Chicken, Swim! This water has the kind of chill that can make you doubt the sanity of getting into it, but it's extremely invigorating and refreshing. We all felt really good after we got out. Hmm, maybe that was relief, eh? But no, I think the effect of swimming was beneficial, and of course, fun! Since there are no overnight facilities at this state park, any stop here will involve just a swim and then driving away at the end of it. So you'll be wanting those swimsuits to be where you can get to them. We've had so many times on trips when we were ready to swim at a beach or lake, but we had to take out every bag and dig to the bottom of each, to find the various pieces of swimwear for each person. When done from the back of a vehicle, while all the kids are chomping at the bit to hit the water, this can be a tiresome exercise. So finally we figured out the solution is to either a) carry a "swimsuit bag" featuring everyone's swimsuits, goggles, sunscreen, flip flops, etc., or b) make sure that each person's bag gets the swimsuit added last - so that they are right on top. The park does not sell food or beverages. Packing a lunch would be ideal. There are a ton of picnic tables, most of them with full shade. There are covered pavilions you can reserve. 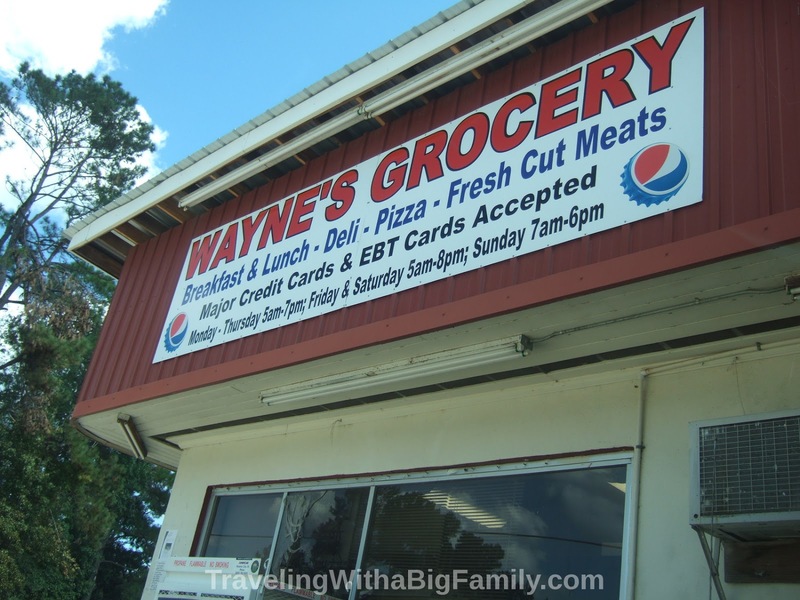 If you've shown up with no food, there's a gas station called Wayne's Grocery very nearby, which sells a few gas station-type foods. We stopped by there briefly on our way out. They sell chicken wings, pizza, corn dogs, and stuff like that. Mostly it's the sort of stuff that is made elsewhere, shipped-in frozen, then warmed up or deep-fried on-site. Their hours are, roughly, 5am to 7pm most days, with shorter hours on Sundays, and staying open an hour later on Fridays and Saturdays. However, food is served only at mealtimes - not all day. The place we describe here is Ponce de Leon Springs State Park, located at 2860 State Park Road, Ponce de Leon Springs, Florida, 32455. 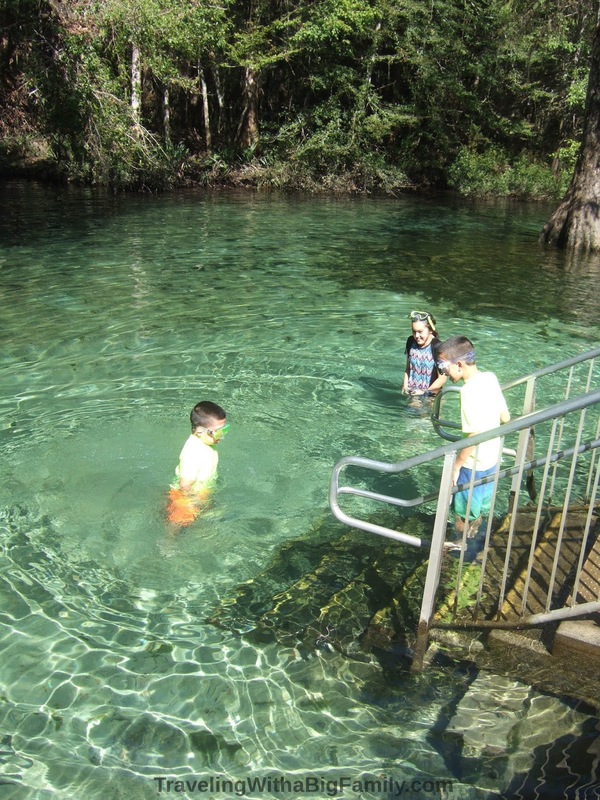 If this state park's natural springs don't happen to be near your travel route, there are 600+ (possibly 1,000) natural springs in Florida. Around 40 of them have facilities, and/or are located inside state parks. For us, this one was only a 10 minute detour off the main road. Here's a few more to consider: http://www.floridasprings.org/visit/map/. And if you're headed that way because you are on your way to a Florida beach, be sure to check out our post on red tide first (that article is here). What's the coldest water you've ever entered? 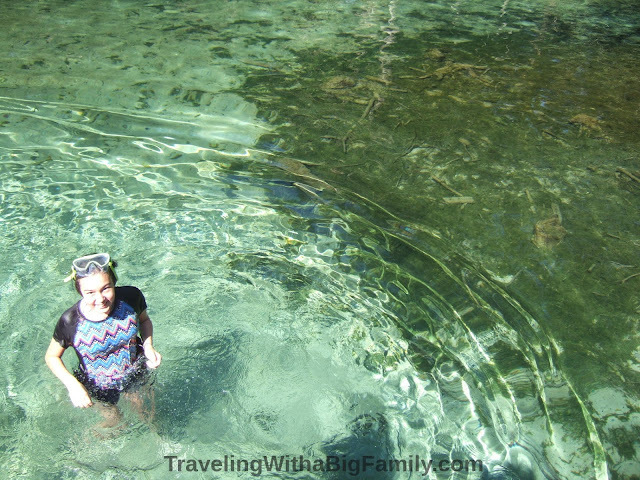 Ever swam at a cool natural springs? Which one(s)?